Mass notification is different than past notification solutions. Previous solutions involved dedicated locations or software that would receive an alert message. Mass notification typically includes overhead speakers or paging systems to tell everyone within earshot what is happening, and a lot more. One such mass notification system is Alertus. Alertus can accept alerts from emergency push buttons installed in various locations at your building, distress buttons at desks, hotkey commands on PCs, fire or access control systems, NOAA weather alerts, etc. Once an alert is received, Alertus can send the specified alert to mobile or desktop applications, beacons with strobe lights and sounders, overhead paging or phone systems, and large outdoor speakers. The Alertus system is configurable for any situation. We recently installed a system for a financial company that works with consumers. They knew that they could face situations like active shooter, disgruntled employee or customer, sever weather, or a medical emergency. All of these scenarios should be handled differently to get the right information to the right people without causing unnecessary panic or confusion. If an employee encounters a threat, they can activate Alertus. There are wall mounted buttons, an under desk mounted duress button and a hotkey combination for any computer that is logged in that can send the alert. Once activated, all alert beacons show a customer message and make a sound to get people’s attention. Their white noise system and overhead paging systems are used to announce the customer message. Every computer has the message displayed full screen. And the message is sent to each user that has enrolled their mobile application. The system is connected to NOAA weather alerts via the internet. The system filters the alerts by multiple keywords, such as “tornado” and “observed.” Once an important alert is received, the beacons are activated with a specific message and a different sound than scenario 1. The computers display a full screen message and the mobile applications are alerted. Buttons are placed in the gym and maintenance shed in the event of a medical alert. The people that need to know about the medical emergency is limited, so we don’t need to send alerts to all of the beacons, mobile devices, etc. Instead, we send the alert to the one beacon that resides with the button, to let the person know the system was successfully activated. Then we show a message on the computers of the people that need to be alerted. The message displayed tells the responders where the medical event is located. By only notifying the people that need to know, and telling them exactly where the emergency is, we limit the confusion and panic of the situation, while still resolving the issue quickly. 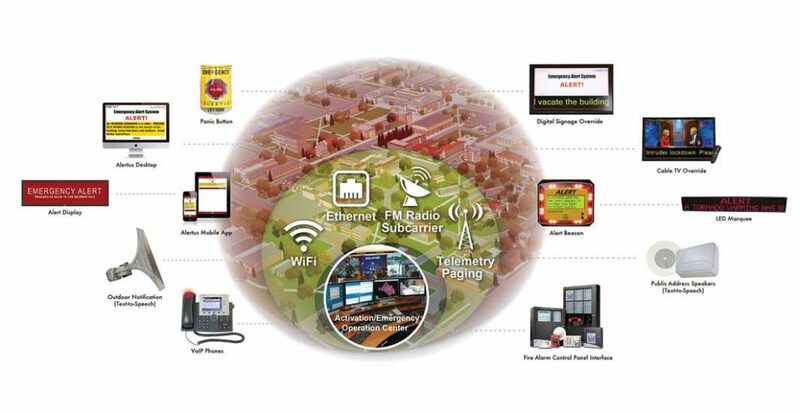 The Alertus system is highly configurable and each scenario can be customized to fit your needs. Alertus has several integrations and lots of options for each one. If you would like to learn more about mass notification systems for your business or campus, please give us a call. https://kentonbrothers.com/wp-content/uploads/2017/07/Alertus-Featrued.jpg 768 1064 Neal Bellamy https://kentonbrothers.com/wp-content/uploads/2017/10/Kenton-Brothers-Logo.jpg Neal Bellamy2017-08-10 21:13:352018-02-06 09:28:33A Tornado is Coming!